ilulz Blog: Leandro Granato paints with his eye! When I first saw this I was shocked, this looks terrible even if whatever stuff he is using is safe for his eyes, it is still terrible! 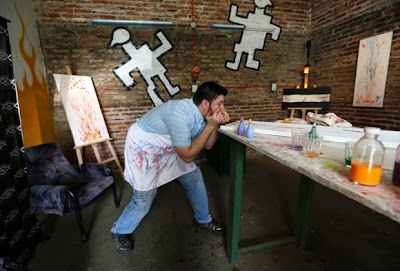 However, Leandro Granto is an artist from Buenos Aries, Argentina, who paints using only his eye as a paintbrush. First he puts the paint into his nose, next he forces the paint up through his eye and finally applies it onto the canvas! I seriously don't see any artistic creativity here, do you?